The NWOBHM saved hard rock from perishing when the old giants LED ZEPPELIN, BLACK SABBATH and DEEP PURPLE went astray musically in the late 70-ies. The period was short, the main years were 1979-81, but more waves followed up until 1986. Many of the bands have never taken a break, or have returned after a lot of interest via the internet. The Britons (and almost exclusively them) have influenced bands like METALLICA and MEGADETH. The members of ROXXCALIBUR more often play in bands like ABANDON or VIRON. As ROXXCALIBUR they are booked for Keep It True that happens now on 24 and 250409, they will perform the songs together with chosen members of bands like BLITZKRIEG, CLOVEN HOOF and JAMESON RAID. 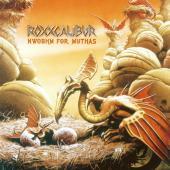 In difference of Lars Ulrich´s ”79´Revisited” tribute ROXXCALIBUR leans towards a larger proportion of more unusual diamonds of the NWOBHM. My guess is that most people have never heard of TRIDENT or RADIUM. In order not to lose the sense of young will, lack of resources or joy of playing the band has chosen to use as little as possible of available studio tricks. Just in time for the 30th Anniversary of the salvation of hard rock it is possible to once again hear classics and hard to get gems. The intro “Big Ben” makes a tea cup grow out in my hand – in all simplicity. Many may have heard CLOVEN HOOF´S “Gates of Gehenna”, JAGUAR`S “Axe Crazy”, WITCHFINDER GENERAL`S self-titled epic, “Let It Loose” by SAVAGE (formerly covered by a young METALLICA) and “See You in Hell” by GRIM REAPER. But don´t forget the likes of JJ´S POWERHOUSE and the great “Running for the Line”, DARK STAR`S strong “Lady of March” or TRIDENT´S classic “Destiny”. Do I miss anything? Sure, CHARIOT`S “Warriors”, ELIXIR`S “Treachery (Ride Like the Wind)” and something by bands like AVENGER, SEVENTH SON, SAMSON, LEGEND, WITCHFYNDE, MYTHRA, GASKIN etc, the list goes on. But that is nothing that can´t be saved by a PT2, 3 etc. The mix, the live in studio feeling, everything is right here. Buy this album and wave the Union Jack!